There I was... next to gate 46 in the San Diego airport. My husband and son had just gotten on one flight while my daughter and I were left behind. What to do? Find something to EAT, of course! Have you ever tried eating in an airport when looking for something dairy-free? and tree-nut free? Go Picnic Product Review from S.A.F.E. If you, too, manage food allergies in your home, you know why I was doing the 'HAPPY DANCE' when there, across from gate 46, was a stand that contained products which were ALLERGY~FRIENDLY. And not just a LITTLE allergy~friendly... but A LOT! I whipped out my camera and had to take pictures to share! I'm talking all-natural, kosher, vegan, no artificial colors, no artificial flavors, gluten-free, dairy-free, egg-free... free of the top 7 ALLERGENS FREE! The downside is that the product is produced on equipment which also processes soy. gopicnic sunbutter and crackers, ready to eat meal, GoPicnic Inc., 4011 N. Ravenswood Ave., #112, Chicago, IL, 60613. 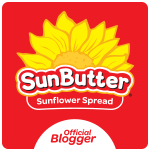 If you are familiar with SunButter and Enjoy Life brands, you are going to love this on-the-go option. If you want more info about the ingredients in each of these specific products, be sure to check out this GoPicnic SunButter & Crackers link. Now, not all of the GoPicnic products are this allergy~friendly, and it was a bit expensive in the airport. You can find them much cheaper on-line. 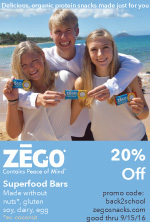 They are great option to have on hand if one is traveling with multiple food allergies. But I was thrilled to have a safe snack she could enjoy, and that WAS something to dance about!